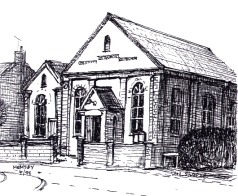 This original Primitive Methodist Chapel was built on the outskirts of Hemsby in 1879 on the corner of Taylors Loke, Martham Road and Waters Lane, near the village hall and playing field. Hemsby, 7 miles from Great Yarmouth, is a major holiday resort, with widespread facilities throughout the year for holidaymakers. Recent developments in the village for housing mean that the Chapel is very conveniently placed for access in the old village. We have some dedicated car parking behind the chapel in Taylor’s Loke. Our noticeboard announces all our special events. We give a warm welcome to every visitor. May to September: Coffee Morning Wednesdays at 10 a.m.